Polar bears (Ursus maritimus) are as deadly and powerful as they probably look! But their looks can only tell us about their size more than anything else. 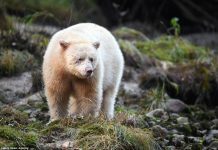 If we deeply study the characteristics and physical features of a polar bear then perhaps it can reflect on its ability to stand out in the entire animal kingdom. Ice bears are extremely strong and well-developed and they have long dominated their ecological niche in the Arctic’s frigid habitat. Very few mammals enjoy the same status. Polar bear’s neck and skull are so powerful that it can pull animal nearly the size of its own. 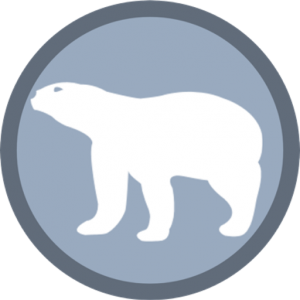 Let’s take a look at the adaptive features of polar bear. Polar bears are primarily known for their acute sense of smell. Thanks to its sharp nose with the help of which the bear is able to smell its primary prey (ringed seal) hidden 2 feet under the snow. This is quite remarkable adaptive feature because it allows the animal to sense the wind direction and then follow the smell. They are thought to detect the animal’s movement from 1.6 km away. Even the thick snow cannot prevent the seal from exposing itself to the arctic’s predator. If the seal is exposed on an open ice the bear senses it from as far a distance as 20 kilometers. Polar bears possess the longest snout of all Ursids and there is good reason for this adaptive feature. Arctic bears must hunt seals to stay alive but seals remain in water. Bears while standing on the ice float attempts to reach the prey by smashing the ice. The long snout helps her to get to the prey with minimum resistance. The snout also performs another function in that it serves as a tool to make cool air warm so that the air gets moistened before reaching the lungs. 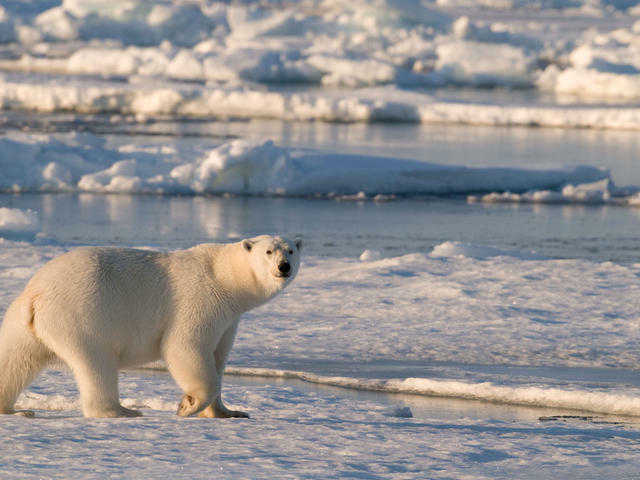 Read More: How Far Can a Polar Bear See? Polar bears seem to have dark black eyes but they are fairly smaller as compared to the animal’s body size. The small size of polar bear’s eyes possibly reduces the risk of snow blindness. There is a nictitating membrane that surrounds the eyes so that the bear doesn’t get hit directly by the sunlight. Polar bears can also identify colors but the vision is quite limited. Read More: Do Polar Bears have Sharp Teeth? There are total 42 teeth inside polar bear’s mouth but all of them are of different sizes. The canines are the largest, sharpest, and the most powerful of all teeth. Bears use their canines to tear the soft parts of the flesh. Incisors are the smallest and deciduous teeth. 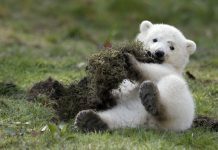 Polar bears are capable to rip the hardest flesh with their penetrating sharp teeth. Read More: Why Do Polar Bears have Small Ears? The polar bear’s ears are rounded but short. This is probably an adaptation to enable the bear to swim for hours and even days. If the bear had long ears the water would have entered the ear canal and damaged the ear drum. This has been a quite useful trait because ice bears spend more than half of their lives under water. Polar bears have got quite many special feature to deal with the Arctic sea ice. Polar bear physical features. Photo by World Wildlife Fund. Main Article: How Long are Polar Bear Claws? Unlike tigers, polar bears have non-retractable claws. Bears walk with claws exposed all the time and thus providing a firm grip on the icy surface. Arctic bears can also hold prey with their claws which gives an edge to other predators. Read More: Why are Polar Bears White? 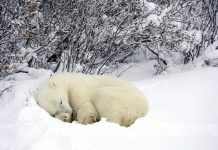 No wonder polar bears are covered with a dense coat jacket which prevents the animal from getting hit by the extreme cold. This is the only way to survive the harsh environment of the tundra. The polar bear hair is divided into two classes—external guard hairs and an insulating underfur. The guard hairs are little silky, transparent and hollow. Bears have 10,000 hairs per square inch. Another trait is that polar bear hairs are water resistant so that water doesn’t stick to the coat. 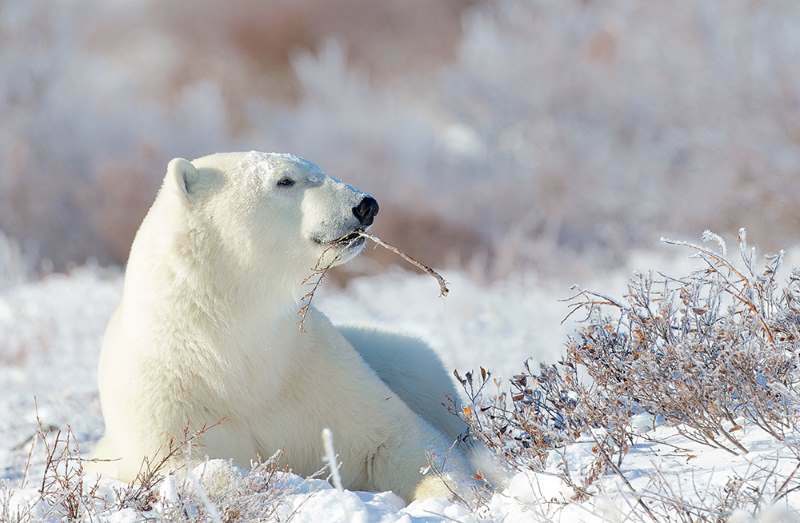 Polar bear’s hair lacks pigment which means it adopts the color of the light that shines on it. During sunset or sunrise the bear becomes yellowish-orange. The molting begins in spring and ends in late summer. During these days many bears would appear to have black spots on their body. This is because black skin becomes visible where hairs disappear. Read More: Do Polar Bears have Tails? All bears including polar bears have short tails—possibly one of the shortest tails in carnivorous land mammals. Polar bear’s tail is even shorter as compared to other bear species probably because it prevents the considerable heat loss from the tail. Read More: Why Do Polar Bears have Large Feet? White bears have exceptionally large and wide paws as compared to their overall body size. The paws are meant to distribute the bear’s weight over the surface area so that she can move efficiently on the snow. 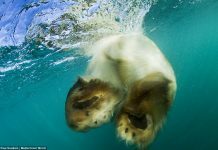 There are papillae that cover the pads of the polar bear’s feet. The papillae are also called dermal bumps. They prevent the animal from slipping while gripping firmly on the snow. Polar bears have partially webbed feet so that they can swim with ease. 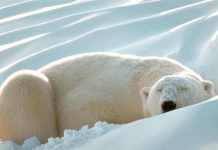 Polar bears are blessed with amazing ability to navigate the Arctic Circle using their extraordinary sense of direction. They are quite expert in finding way back home even in absolute darkness which can last for as long half a year in the Arctic. Scientists have not been able to uncover the real cause of this skill. It is reasonable to assume that polar bears possess a special compass (within) that coincides with the earth’s magnetic field to show them their way. Unique in polar bear’s stature is that its body is narrowly built with an elongated neck and face. Looking from sideways polar bears appears to be slanted from the front. This is due to the fact that their front legs are shorter than their hind legs. The slanting body assists the animal to get to the breathing hole. Ice bears have an outstanding stomach in that it can process meat with the highest contents of fats. There would hardly be any animal in the entire kingdom that digests such fats. Juveniles rely on seal’s meat whereas adults mostly consume the blubber. 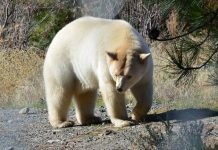 White bears are sexually dimorphic mammals. Adult females are 2 – 3 times smaller than the adult males. Except for the size no other major difference is thought to be observed between two sexes. Ice bears are insulated with the 4-inches-thick layer of blubber. Half of the bear’s weight consists of its blubber. The blubber together with the bear’s fur serves as thick jacket and the jacket makes the bear to afloat whilst swimming. The blubber also performs a useful function of energy storage. During warmer months bears rely on these available fats since the seal hunting becomes impossible. When bears want to consume reserve fats the oxygen is mixed with the fat to give metabolic water and carbon dioxide. Freshwater is a rare commodity in the Arctic Circle but polar bears know how to deal with the water scarcity. YOU MIGHT LIKE THIS TOO…? POLAR BEAR ANATOMY: The average heart beat rate in adult polar bears is 60 to 90 bpm however in cubs the rate reaches high up to 130 beats per minute. The high bpm in cubs is mainly because of their activity level. POLAR BEAR SKULL: The polar bear’s skull is a typical of any other land carnivores. Bears unlike other carnivores have relatively deep and flattened mandibular fossa. POLAR BEAR ORGANS: The polar bear’s heart is slightly larger than the human’s heart but it is less than one-third of the hippo’s heart. The four-chambered bear’s heart consists of left and right ventricles as well as left and right auricles.